Has multimedia keys and other shortcut keys. No batteries or charging, It operates using the power of your iPad or iPhone. LED indicators tell you when caps lock is on and when the device is properly connected and getting p.bizower. Simply plug into your iOS device and it works. Comes with an iPad stand. 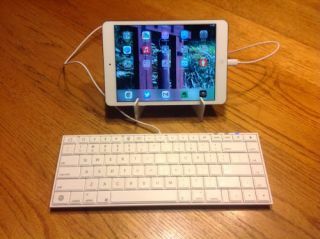 Most Bluetooth keyboards for iPads cost around $79 to $99. The Macally iKeyLT costs $59.99 plus shipping. It really is worth it for the user looking for a full-size keyboard with Thunderbolt connectivity. The device advertises being compatible with the iPhone 5, iPad (4th Generation), iPad Mini, and iPod Touch (5th Generation.) The cost of this keyboard might make it a bit more palatable for the classroom teacher or administrator looking for keyboards for student-used iOS devices too. For more information, check out the Macally iKeyLT Web Site Here.